It is difficult to describe “Disgraced,” the Pulitzer Prize-winning play by Ayad Akhtar that opened on Oct. 23 at the Lyceum Theatre. Its advertisements focus more on its TV star cast, which includes Josh Radnor (“How I Met Your Mother”) and Gretchen Mol (“Boardwalk Empire”), than the actual plot, and its website offers vague descriptions like “a provocative tale of big city aspiration and cultural assimilation.” This explanation provides little information about what happens on stage, but it gives audiences a good idea of what the play will have them think about. Rest assured, “Disgraced” will make viewers think. This drama about a disastrous Upper East Side dinner party presents compelling ideas concerning perception and prejudice. The party is hosted by Amir and Emily Kapoor, played by Hari Dhillon and Mol. The Kapoors are well-off — he is a lawyer at a prestigious firm and she’s an up-and-coming artist whose latest show is inspired by Islamic art. Amir is hyper-aware of how society views his Muslim heritage, so he goes to great lengths to distance himself from it. He abandoned the religion, changed his name and vehemently avoids Muslim activists, whom Emily pressures him to meet. Despite her good intentions, Emily is a breathing characterization of white saviorism. She defends Islamic culture and history, but in her attempts to empower Amir she misses, or perhaps ignores, the fact that Amir controls his own identity, thereby undermining the cause she’s attempting to fight for. Their relationship provides an intriguing thematic conflict, but unfortunately their chemistry falls completely flat. Additionally, Amir’s exchanges with his young cousin Abe (Danny Ashok) feel haphazard. The one relationship that feels genuine comes from Isaac and Jory — the couple that joins the Kapoors for dinner. Played by Radnor and an exceptional Karen Pittman, this couple feels uncomfortably real in the way they tease and passive-aggressively jab one another. Their amusing banter provides a distraction from the tension brewing between Amir and Emily — but that does not last long. The dinner starts with amiable chit-chat, but when religion comes up, as it inevitably does when Emily is in the room, the characters became very tense very quickly. The scene is challenging to watch, first because of the extreme prejudices the characters admit to and later because of the disturbing violence it builds to. There is screaming, hair-pulling, spitting, crying and punching, and that is all before the climax. Some of these histrionics feel gratuitous — the dialogue is strong on its own, and the theatrics take away more than they add. Akhtar’s ideas cut through the chaos at the climax, however. At its best, the play’s final moment reinforces the question of perception, asking the audience how they really see each other and themselves. At the very least, it warns against discussing politics and religion at parties. 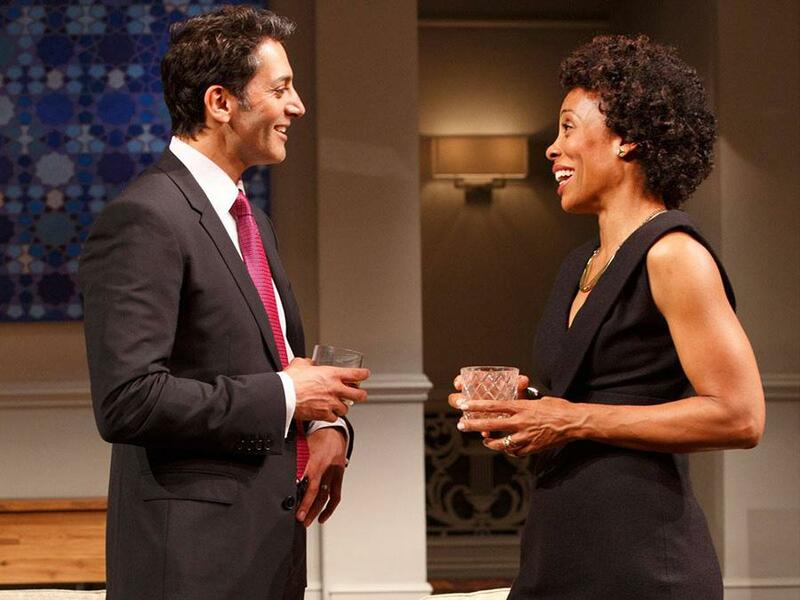 “Disgraced” is playing at the Lyceum Theatre, 149 W. 45th St., through Feb. 15.